"SURE / BREAK - PATENT / APL'D / FOR" Target Ball, America, 1875 - 1890. Yellowish golden amber, octagonal body with four concave panels around the shoulders and base, 2-piece mold, rough sheared mouth, 2 ½" wide, very near mint; (a superficial, light scratch, approx. ½", near the "T" in "PATENT", otherwise perfect!) An extremely rare and desirable ball. The "SURE BREAK" balls have always been revered by collectors, and would be at the pinnacle of almost any collection of target balls. Stars and Stripes pattern Target Ball, America, 1875 - 1900. 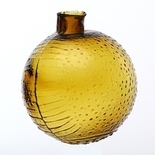 Beautiful golden yellow coloration, known as the 'Stars and Stripes', or 'Stars and Bars' pattern, the ball is covered with tiny embossed stars or dimples, and the sides having horizontal strips or bars, 3-piece mold, rough sheared mouth, dia. 2 5/8", perfect! 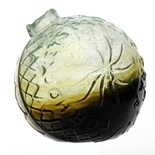 A great example of this rare and desirable target ball, attractive pattern, beautiful light color, outstanding condition. Embossed Dots on Shoulder, "G 6" (on base) Target Ball, America, 1875 - 1900. 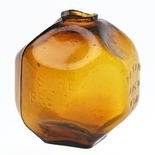 Golden amber, (3), large embossed dots on the shoulder, 3-piece mold, rough sheared mouth, dia. 2 5/8", perfect. Not the most fancy target ball, but certainly a mold variant that you don't see very often! "FOR HOCKEY'S PATENT TRAP" Target Ball, England, 1875 - 1900. Bright, medium grass green, embossed pinwheel design on both sides with a crosshatch pattern around perimeter, 2-piece mold, rough sheared mouth, dia. 2 5/8", perfect. These "Hockey Patent Trap" balls are very scarce. They have a pleasing 'look', and have always been popular with collectors. This particular example is especially nice having excellent clarity to the glass. "FOR HOCKEY'S PATENT TRAP" Target Ball, England, 1875 - 1900. 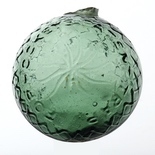 Aquamarine with dense tobacco, virtually black striations swirled through the lower half of the ball, embossed pinwheel design on both sides with a crosshatch pattern around perimeter, 2-piece mold, rough sheared mouth, dia. 2 5/8"; (a dug ball with some light stain and a 3/8" iridescent flake on the inside edge of the rough sheared mouth). 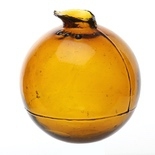 A unique ball with the dense amber swirls in the lower half giving it a two-tone appearance. 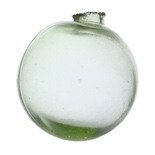 "PAT 1876" (around neck), Target Ball, America, 1876 - 1880. Pale green, almost a light Vaseline coloration, 2-piece mold, rough sheared mouth, dia. 2 5/8", near mint; (the embossing on the neck is somewhat illegible and not easy to read, and there is a little scattered minor residue or film on the interior, likely washable, otherwise excellent). A very rare, and likely one of the earliest, of all the target balls. 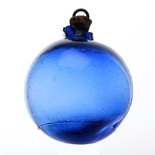 Unembossed Target Ball / Folk-Art Christmas Ornament, America, 1890 - 1892. Yellowish-honey coloration, 3-piece mold, "2" (on base), rough sheared mouth with cork and string, dia. 2 5/8", perfect. 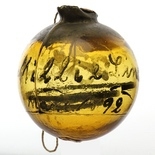 This unique ball was fashioned into an ornament, hand painted in gold lettering, "Millie Line / Mar. 6. 1892". (possibly notating the birth of a child). In addition, there is a scallop design painted around the shoulder, and a narrow spring coil on the interior for decoration. One of Ralph's favorite balls. Unembossed Target Ball, America, 1875 - 1900. Cobalt blue, 3-piece mold, rough sheared mouth with period cork and heavy wire hook, dia. 2 5/8", perfect. Ralph nicknamed this the "Christmas Ball" for obvious reasons. Someone back in the day had fashioned it into a folksy kind of Christmas ornament. 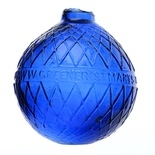 "WW GREENER ST MARYS WORKS - BIRMM & 68 HAYMARKET LONDON" Target Ball, England, 1875 - 1900. Cobalt blue, quilted diamond pattern above and below center band, 3-piece mold, rough sheared mouth, dia. 2 5/8", perfect. A great example with crisp, very strong embossing, in a beautiful, deep vivid color.